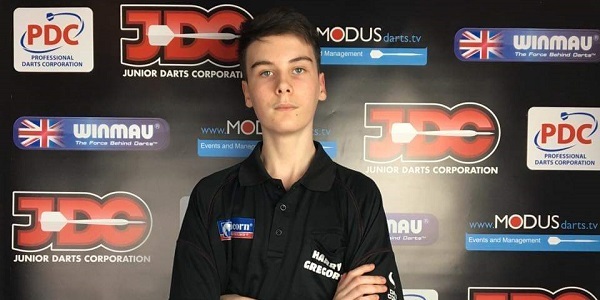 HARRY GREGORY sealed his place at the 2018 Junior Darts World Championship following a sensational run at the final Modus UK tour event of the season. Gregory, nicknamed ‘The Hawk’, had previously appeared at the Chorlton leg of the tour in July, knocked out by Lennon Craddock in round two on that occasion. His victory in Event Eight would come after a terrific performance in the final against fellow Lancastrian Nathan Care. Only a title win would qualify the Lancashire thrower for December’s Junior World Championship, and that’s exactly what he did. Gregory began the title chance in emphatic style, a 3-0 victory over local star Ashley Marson. He then defeated the heavily fancied Leighton Bennett in a nail-biting last-leg decider. He was quick of the blocks to deny Kent’s Kyle Manton second JDC title, after his win in Chorlton, before a dominant display saw him overcome a heavy-scoring Freddie Box in the quarter-finals. Sean Craig would provide the opposition for the semi-final and troubled an out of sorts Gregory in a sloppy encounter. There were missed doubles aplenty as Craig hauled himself back into the match late in proceedings, before the 14-year-old got himself out of trouble on double ten. In what was billed as a Lancashire darting derby, Gregory took on 14-year-old prodigy Nathan Care. Despite a nervy opening leg, Care held throw to give himself the early advantage. Two ton plus scores and a 74-checkout pulled Gregory level before another strong scoring leg broke Care’s throw. The cushion would be extended to three legs as Care missed three darts at tops to halve the deficit. Care would reduce the arrears before Gregory made him pay with some more terrific scoring, with legs of 17 and 18 darts enough to seal a 5-2 victory and the JDC title at Riley's Wolverhampton. The JDC World Championship will take place at the Action Indoor Sports Arena on December 16, and will be preceded by the Scott Farms European Open and Go Darts Pro Team event on the Saturday and Friday respectively. For further information about the JDC, please visit www.juniordarts.com or follow @JDCDarts on Twitter.